Last night I had another one of those life-changing moments. . . and this one was a doozy! I have been blessed with a long life full of adversity. That’s not always bad. It’s taught me a LOT and how to change up mid-stream. I’ve had to reinvent myself many times in these decades, but last night threw me for a real loop. You need a little background here to explain. When I was young, my Grandpop used to babysit me while my mother worked. Grandpop was the most important man in my world. In some ways, he still is. . . and he’s been gone since 1979. He’s the one who taught me to roller skate, ride a bike, draw, make things and do everything that makes childhood wonderful. We used to go to the park every chance we got. I grew up in a city and the park was peaceful. We talked, we drew, we laughed, he taught me about the different birds and squirrels. Total bliss for a little kid. One rainy day we couldn’t go to the park and there wasn’t really much to do at his house. I thought we’d just watch TV or color. He disappeared for a moment and then came back with some things in his hands. He said, “Come here. I want to show you something.” He handed me four pencils and a ball of string and then proceeded to teach me how to knit. He taught me to knit in a seamless circle because that’s all he knew. Grandpop was from a huge family with lots of brothers and only one sister. His mother knit all their socks. She pressed the boys into service, even as older teens. They had to knit so many rounds on the socks before they could go out at night. Grandpop was always thought of as the “dumb” one in the family, but he was smart about this. He figured the better he learned it, the faster he could do it and the faster he could get out of the house! So on that rainy afternoon long ago when I was five, he taught me a new skill and created a monster, all in the course of about an hour. From that point on, I knit everything there was to knit. If I couldn’t figure out how to do it, I went to the library and took out books. Two years later, I found a book at Hoy’s Five and Dime in Sea Isle City, NJ on something called crochet, bought the book and a hook and taught myself how to crochet. I never liked it as much as knitting, but I did it from time to time and when the situation called for it. Fast forward to last night in another world where that little girl is now an old lady with lupus, fibro and arthritis, a lot of it settling in her hands. About five years ago, a doctor told me to quit knitting due to hand strain. Yeah, right. After all those years of knitting English or right-hand throw, I taught myself how to knit Continental or left-hand throw (easier on your hands). Now I can knit seamlessly with either hand. Well, I could. . . I hadn’t knit in a while. My hands had been really painful, but it never dawned on me that it would affect my knitting. I picked up some needles and yarn and took off on a new pattern. I stopped after about two inches. I wanted to cut my hands off. The pain was incredible. I stared down at what I had done. It looked all right, but I couldn’t do one stitch more without screaming. I sat there and cried as I tore the project out. I have changed things many times, as I said at the beginning. I have changed ways of doing many things, I have changed jobs, I have changed my core beliefs about things. But somehow, knitting never changed. It sustained me through a lot of hard times. It wasn’t something I did. It was who I was. Now that “me” was no longer. I told myself it was temporary, that it would pass. I know better. The pain has been getting worse and worse over time. I simply refused to acknowledge it. Last night, that pain drew a line in the sand and said “NOTICE ME!” in letters too big for me to ignore. Once I stopped crying and got my head on straight, I started to think. This was NOT going to get the best of me. . . but it was coming damn close. . . too damn close. What to do? I tried casting on again and noticed that the searing pain was in my left hand, not my right. That was good as I’m right-handed. The word “crochet” sailed across my mind. One hand. One hook. All that yarn could still be put to good use. “But I don’t like to crochet all that much,” said Old Busted Hotness’s brain. “Too damn bad,” answered Old Busted Hotness’s common sense. So I located my hooks, got some yarn, found a pattern and tucked it all away in a bag for today. When I take a break, I’m going to crochet. As a kid, I taught myself to knit anything. Now as an old lady, I’ll teach myself how to crochet anything. I can do it. I’m just stubborn. But I’m not giving up fiber. 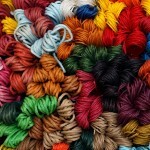 I’m betting on the fact that it’s the fiber that’s who I am, not the motions of knitting. Making things. . . watching something come alive in my hands. That’s available in crochet, too. I’ve seen a lot of professions of love, beautiful Valentine’s Day cards and many warm and loving sentiments floating across my Facebook newsfeed this morning. Then I saw an article by my friend Michele Gwynn about what folks really want for Valentine’s Day. You can read that HERE. And then it occurred to me that most of what I was looking at was for younguns. Some of us are no longer young. So that got me to thinking. . . what would older folks want for Valentine’s Day. Well, if you’re married, I think you want to be remembered. Cards, flowers and candy sometimes get lost in the progression of years and it becomes just another day. Even a peck on the cheek with a heartfelt greeting of “Happy Valentine’s Day” can do it for you. If you get more than that. . . WOOT! No card, peck on the cheek or otherwise? Make your love’s favorite dinner. You’ve been together a long time. You know what it is. If dinner can’t be changed, make cupcakes or some other quick and easy dessert that’s your love’s favorite. Even a drink can be special. Sprinkle some cinnamon in a cup of hot chocolate. It’s easy to say, “Hey, I appreciate you hangin’ around this long and I’m glad you’re still here.” Sounds like a lot less than a gushy, passionate “I LOVE YOU,” but after you’ve been together for a long, long time, you’ll see what I mean. If you’re alone, this may be one of the worst holidays for you. Everyone’s preaching love and togetherness. You probably feel like you just don’t belong. So love yourself. Buy yourself some flowers or candy or a little something you want. Reach out. You’re not the only lonely person out there. Go to a nursing home and visit. Don’t laugh. My grandmom used to volunteer in a nursing home when she was older than most of the residents! You will put smiles on people’s faces but the best part is you’ll put a warm glow in your own heart. If you’re an older couple on a fixed or tight income, there are a lot of things you can do to show your love that you care without breaking that already meager bank. Make a Valentine card. Go to the dollar store and get some construction paper. Surely you remember construction paper? Play like you’re a kid again and make a Valentine. It doesn’t have to be perfect or look like it came from Hallmark. That’s the beauty of it. Write your heart on that red paper. Cut up a paper lace doily (yes, they still make them) and trim. Voila! Instant love. Dinner at a fancy restaurant is nice, but getting a coffee from Starbucks or other coffee shop is nice, too. A burger at McDonald’s will do the trick (if your heart can take it). The point is to eat the meal with the one you love. What you eat is really unimportant. Grilled cheese sandwiches and tomato soup at home will work just as well. Need an inexpensive Valentine gift? Fancy chocolates are great, but you can just as easily go buy some candy hearts (that dollar store again!) and put them in a fancy Valentine box or tie them up in a square of red felt or even paper; adorn with a ribbon. If you know your person has a favorite candy bar, one of those will do just fine, too. It’s the love that counts, not the price tag. If you can afford a movie, that’s a nice night out. If not, rent one from one of the red or blue boxes. Our Redbox rents for $1.28. Get some hot chocolate or other beverage of choice and cuddle up on the sofa. There are lots of things you can do, even if you are an old fart, and, yeah, it’s sill early on Valentine’s Day, so if you’re old and thinking this day is past you or you’re still young and in love but broke, there are many things you can do. Now go show someone you love them! Pope Benedict XVI shocked the world this morning with the announcement that he would resign the Papacy at the end of this month. He not only caught Catholics worldwide unaware, but even his close friends claim they didn’t know he was going to do it. He’s old and he’s sick. He’s probably tired, too. And while 85 is not ancient, as Popes go, he’s still getting up there. He had a stroke in the early 1990s and I believe I read he has heart problems, too. They say he tried to resign before becoming Pope, but stayed on as a favor to his good friend Pope John Paul II. You know what I think? I think he woke up this morning and had a moment of personal revelation. Revelation about what, you say? It’s waking up and realizing things have to change and change now. Right now. That you can’t go one minute longer with things the way they are. You can’t do what you did yesterday without dire consequences or even. . . death. Those of us with chronic illnesses known these moments well. Some of us know only one. Some of us know many more. It’s waking up in the morning and you can’t swing your legs out of bed. All those errands you have to do will have to be done by someone else. It’s waking up and your hands don’t work anymore. All those articles you were going to write aren’t going to get written until your hands (hopefully) come back to life or you finally install that Dragon software that’s hiding on a top shelf. It’s not being able to get through the day without intense pain unless you rest a few minutes an hour. You didn’t have to do that yesterday, but you do today. Personal revelation. Not crying about it. No wringing of hands. Simply knowing your life has to change and it has to change now. I think that’s why Pope Benedict did what he did. I think with all his ills and the fact that he’s getting on in years, all the hatred directed at him over his stances on modern issues, just. . . well, all of it. I think he woke up and said, “Lord, I simply can’t do this anymore. Forgive me.” And then he wrote his formal resignation and shocked the world. If you haven’t had one of these moments yet, trust me when I say you will. It may come at 18. 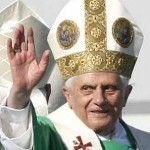 Like Pope Benedict, it may not come until you’re 85. But a personal revelation moment will come. What will you do? You’ll have to change. You’ll have to change right now. My prayer is that you will be ready. My 16-year-old was in the bathroom the other day getting ready to go out. Nothing unusual. Her makeup was all over the bathroom counter and her straightening iron was getting good and hot to take the gorgeous waves out of her hair, the way she likes it. I happened to glance down at my watch and note the time. She wasn’t due where she was going for 2 – 3 hours yet. And then I looked at the shirt she was planning on wearing, casually tossed over the chair, NOT one of my favorites. My mouth was open with words on the tip of my tongue and. . . I bolted out of there like the hounds of hell were hot on my tail. My 16-year-old heart was crushed. I had just spent 2 – 3 hours trying to look good. I was never as pretty as that kid of mine is so I worked extra hard at it. And in eight words, the person who was supposed to love me no matter what shot me down and shot me down hard. She did it all the time. And I was just about to pass on the tradition. My mother was about to come out of my mouth. Will this woman never leave me? She didn’t like me. I was and still am an embarrassment to her, the way she sees it. I will be working at getting her out of my head until the day they nail me into a box. But this is something that has to stop here and now. I have to be more aware. I have vowed not to repeat the pattern. Admittedly, my kiddo is a bit stuck on herself. Why? Because in an effort to not do what was done to me, I have told her since Day 1 that she is beautiful, intelligent, hot, the best, that she can do whatever she sets out to do. Some have told me I created a monster. Maybe. She has problems that I didn’t create, but one thing she doesn’t have is a problem with her self-worth. Apparently, though, I haven’t broken that chain entirely yet. I was about to say something derogatory to her about what she was going to wear. Did it matter? Probably not. The shirt she was wearing was not something I’d wear. Gee, I wonder why? She’s 16 and I’m 60. I thought it looked “trashy,” but it covered her. She’ll grow out of some of this. I didn’t wear the same stuff at 21 that I did at 16. I know this. But there I was, about to inflict the same kind of damage that I’ve been fighting against all my life. The good news is that I stopped in time. This time. Will I stop in time next time? Oh, Lord, I hope so. No matter what problems the two of us have (and we have some whoppers), I never want her to look in the mirror and hate what she sees, to think she’s not pretty enough, not smart enough. . . simply not good enough. I know that feeling and wouldn’t inflict it on my worst enemy, let alone someone I love. This is one of those experiences that has made me think. In itself, it’s not much of anything, really. But that “nothing” could have done some serious damage. She’s fragile. What almost 17-year-old girl isn’t? So I will be on my guard for next time, because there will be a next time. That’s how serious this type of damage is. It’s like it never leaves you, but I am damned and determined not to pass it on. Can Old Busted Hotness do it? Film, as they say, at 11.